Does the Water Taxi go to Patriots Point and the USS Yorktown? Yes. 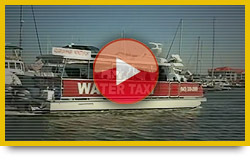 Water Taxis make hourly runs directly to Patriots Point from Waterfront Park and Maritime Center. Where can I purchase tickets? Tickets can be purchased at 5 convenient locations; on board the water taxis, our website, Charleston area Visitors Centers and the Charleston Maritime Center. Where do I park in Mt. Pleasant? Parking is available at the Charleston Harbor Resort and Marina. Resort parking fees apply. Follow signs to Water Taxi. Where do I park in downtown Charleston? Parking is available at the Maritime Center at 10 Wharfside St. just south of the SC Aquarium or any parking garage near Waterfront Park. On street parking is also available. How far is it to Market St. in Charleston? The Market is a short 2 block walk from our landing at Waterfront Park. Is there a different boat for the Dolphin/Sightseeing cruise? Nope. One boat does it all. The trip either direction is about 30 min so we see the sights and usually dolphins. How long is the boat ride if I don’t get off? Approximately 1 hour. Do the taxis run if it is raining? Yes but please call during inclement weather as the schedule may change. Is there transportation available when we get downtown? If you don’t feel up for walking there are DASH trolleys and pedicabs/rickshaws available. Ask crew for details. How does the “all day pass” work? This pass allows you to ride the taxis as much as you would like. Just hop on and off at any of our stops.